OccupyHouston’s next big scheduled event will take place on 11/11/11 – DAY OF SOLIDARITY. More details of this and other events and news details are below the jump. 2) talk specifically about the homeless population issues…. Also below the jump, updates on the latest posted GA minutes (11/4-5/11) and some other agenda details. Click on this link for List of Accepted Proposals, as of November 5. I would like to call a meeting of the women’s group for 2 primary reasons. 2) talk specifically about the homeless population issues. I know this might not seem like a women’s issue, but traditionally women tend to take on related caretaking roles like social workers, etc, and my attention has been drawn to the demographics at the occupation (men to women ratio) and how this is likely to be slowing down the solution finding process when it comes to the homeless population issues. There are other ties to women’s issues, but we can talk about more of the details then. Essentially I want to take action on some of these issues, and would like to utilize this women’s group meeting to get the ball rolling. If you can’t attend, please see me (Cassie) at some point to share our thoughts on #1 (or send it to me via email or facebook). Stand with Occupy Houston and the 99% on 11/11/11 for a peaceful student walkout and celebration of global resistance at Tranquility Park! We call on University of Houston students to meet in front of the library building at 11:00am. At 11:30am we march to Tranquility Park in downtown Houston for a day of solidarity and celebration of global protest movements. The festivities start at 2:00pm in the park! Don’t limit yourself to these! Tighten your thinking caps and lets talk about the issues that drive our movement. At 5:00pm we’ll open it up and celebrate art and poetry. We’ll have an open mic, so come on out and rap, sing, or perform. Get creative! This goes on until it ends, folks. We’re going to do this one right. 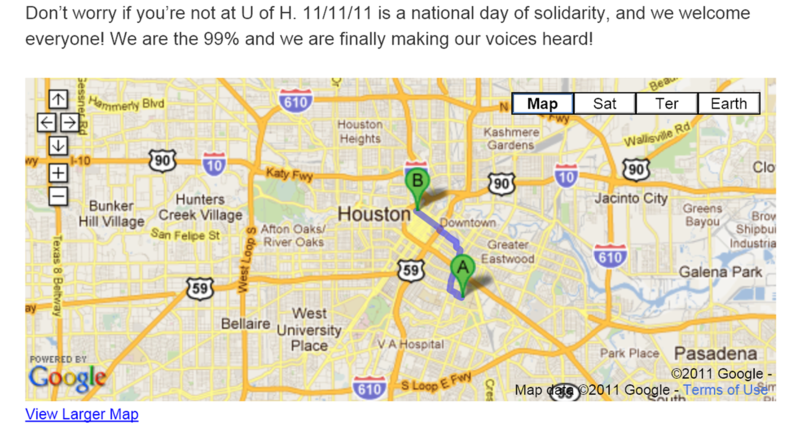 Don’t worry if you’re not at U of H. 11/11/11 is a national day of solidarity, and we welcome everyone! We are the 99% and we are finally making our voices heard! Please direct all comments to the Forums where they will get more attention. If you have a question or comment specifically about the content on this page, copy and paste this article’s URL and click ‘Add a New Topic’ in the forum. Thank you. Cleanliness if important everywhere. If you use plates/cups WASH THEM after use. Everyone needs to clean up after themselves. Courts are split. We will keep you posted. ACLU TX annual conference– Rev. William Lawson very interested in Occupy Houston. We need to get media and PR to correlate info on arrests, etc. We have allies we are talking to OccHou. gist: shares vision and concerns regarding freedom- eloquent writing on these issues, will be adding in his statement as soon as I receive a copy. Artem moves to have Adam’s statement added to the OccHou newspaper. If we are accepting getting arrested it would get media but will also help clarify OccHou agenda. Been a lot of work done to maintain relationship between HPD, mayor and OccHou good. Don’t want to ruin that. We really need to study the causes of current economic crisis. Despite good relations with HPD, mayor, etc. the powers that be are forcing cut-backs to all civil areas. More and more people are getting involved in occupy movements. lull recently around the occupation was just a phase and glad we now know more about what works and what doesn’t. Now we just need to do it! Meaningless to pass actions about being open to certain proposals. Clarifying getting arrested, bonds, etc. Bonds *can* be worked out. Participants in actions have OccHou support and need to not be afraid of arrest. There are also additional sources of bond money available from sympathetic organizations and labor groups. Getting arrested does get attention but so does getting into Outreach to get people to come out and participate. I think radical action will get us publicity, I think radical love will get us more publicity. Every single direct action of OccHou has reached far away places.. like the zombie flash mob and Juan Gonzalez visiting Occupy Houston– who mentioned when he got back to NY that the welcome he received in Houston was one of the best he’s ever experienced. Think how many people want to connect to OccHou but don’t know how. Think how to reach these people. Thinks of direct actions are intelligently directed they would pass consensus. Ultimately it will come down to standing for our 1st Amendment rights. We need to stop cut backs and find solutions. Should not confuse internal goals with forcing having demands, which is not as important. Call strip to cold-call Houstonians about Occupy Houston. Many of us have time here and there and unlimited calling plans, etc. Let’s use these and put some time into calling folks about the movement. Website was down for a couple of hours after being moved to the new server. Problem won’t happen again. Media area is not an internet cafe. If you want to use space please sign up because there are expensive electronics, etc. anyone by finance group sign the list yet to be designated of a lock and key -pass key onto someone else in finance team? in 2 days celebrating our first month. Honorable Eric Cantor having event at Rice 11-10 at 11am – open to public but must reserve seats. We should reserve seats but ten walk out. Veterans for peace are rallying on 11-11-11 join them at 11am Memorial Day parade. This entry was posted in OPINION - POLITICAL, SOCIAL and tagged 1%, 99%, bagby, banks, city hall, college, corporations, corporatism, Financial industry, houston, michael moore, oakland, occupy, occupy houston, Occupy Together, occupyoakland, occupywallst.org, Occupy[YourTown], populist, protest, rusk, texas, TRANQUILITY park, wall street by Thinkwing Radio. Bookmark the permalink.